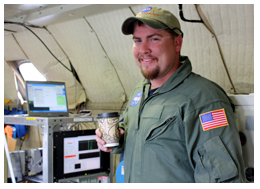 The GPS ground station plays an important role in collecting airborne science data. As with all GPS data there are small errors in position and the airplane GPS receivers alone cannot calculate these errors. This is where the ground station comes into play. The ground station is set up over a fixed position and checked every day before and after the mission for a precise height to the nearest 1/2 millimeter. Knowing the exact position and also knowing that the station does not move during the flight, the data collected here can be overlayed on the plane GPS data and the position errors are canceled out. This cancellation allows for the plane GPS data to have accuracy to within a few centimeters. The ground station must be located near the area where the plane takes data so that they record data from the same set of satellites. 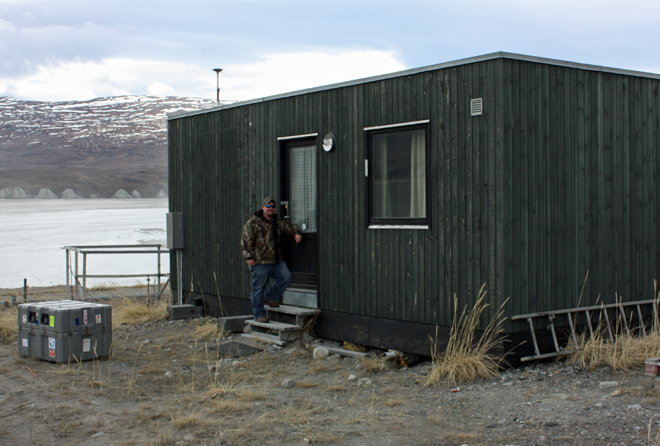 In Kangerlussuaq we are lucky to have access to set up our station in the Danish meteorological building, known locally as the “met hut”. The ground crew — me — has a duty to monitor the station during flight to make sure there is no break in the data due to loss of power or antenna movement. Previous Previous post: An Inland Connection?